Debora teaches vocal, drums, guitar, ukulele, and flute at Melody School. She started her music studies at the age of 3, and has been involved in music ever since. 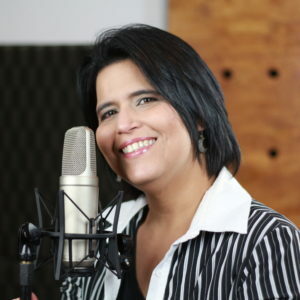 She studied in some of the most prestigious Conservatories in Brazil; The Brasilia’s Music School (Escola de Musica de Brasilia), Escola de Choro Raphael Rabello, and The Brazilian Popular Music Conservatory of Curitiba. She further expanded her voice studies by earning a Bachelor Degree in Speech-Pathology. She has been teaching music since 1997. Debora loves teaching Pop music, musical theatre, Pop/Rock and Soul Music. Her specialty is teaching students to sing and play an instrument at the same time. Debora’s lessons are fun and dynamic, giving her students the experience of making music by learning different genres and making the lessons engaging and interactive.